FILM-COM Down Under is a financing, packaging & distribution market that traditionally brings filmmakers together with Hollywood executives. It is a unique event for both sides of the industry, giving film makers an opportunity to pitch projects and connect with experts in the field in both formal and informal settings whilst creating valuable relationships that can help further their development and film careers. 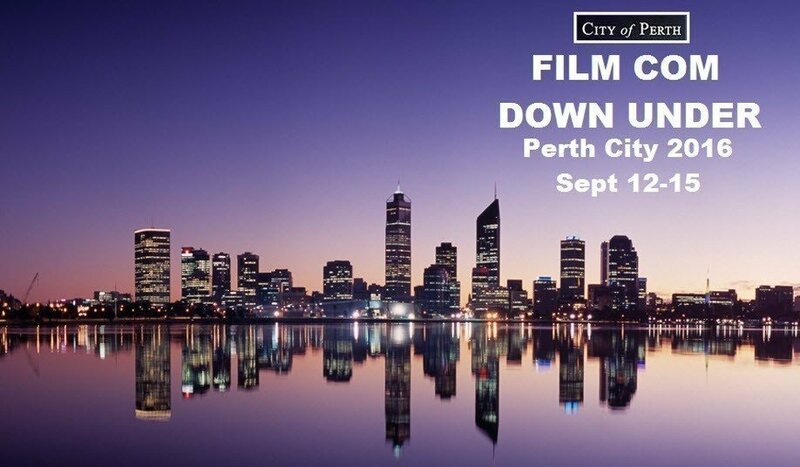 With local support from The City of Perth, Film Com Down Under is packed full of community engaging to suit aspiring film makers/directors/producers, actors, behind the scenes workers or the diehard movie fanatic that simply enjoys a good movie! - Gala Dinner with the Executives: Mix & Mingle with the big shots of the Australian and American film industry! This event promises to be a night of belly laughs, good food & live entertainment! Your perfect opportunity to fit right in with the people who have the power to make things happen in the wide world of film. A one of a kind event to networking with people involved in the industry at all stages, surely an event not to be missed! Your Gala dinner includes Dinner, Soft Drinks, Entertainment (Alcohol NOT included). TICKETS AVAILABLE NOW! - Master Classes: Hosted by Executives themselves, these classes will leave you with invaluable lessons from the people that know – specifically designed to suit individuals from all aspects of the film world. TICKETS AVAILABLE NOW! This online master class will leave you with exactly what to say and what not to say to executives, according to an Executive himself. Designed to provide attendees with a lifetime’s worth of experience in a single class tailored to help you make the most of any pitching opportunities you will come across during Film Com Down Under and other future ventures – See Speed Pitching below. The All You Need to Know of Budgeting hosted by a proud expert budgeter who despite having faced more than his share of financial filming challenges, has never gone over budget. This master class will provide you with all you need to know on how to access funds, spend wisely and be resourceful. This master class is designed to teach you what to do and what not to do when script writing, as well as leave you with advice on what to write, how to present your work and who to present it to. How to write an efficient and effective business plan & stick to it. Working on a budget and getting noticed – the first step is the hardest but also the most critical.